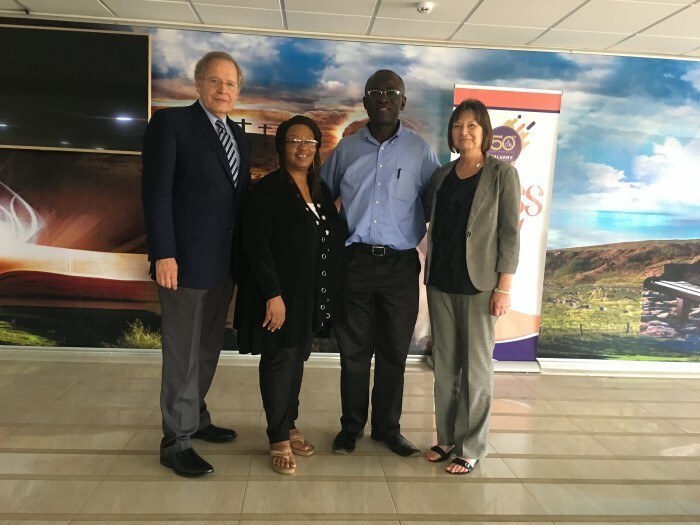 This past May, Truett Seminary’s Associate Dean for Academic Affairs and Professor of Christian Ministry and Church Music Dr. Terry York and Financial Manager Jan Cason traveled to Ghana at the invitation of Dora Bortey, DMin ’04. Bortey is the founder and director of L.I.F.E. (Living For El-Shaddai) Ministries, an organization that focuses on reaching children and teenagers for Jesus Christ. During her time as a Doctor of Ministry student at Truett, Bortey, a dual-citizen of Ghana and the United States, formed relationships with York as her faculty supervisor and Cason as a fellow member (and at the time staff member) of Meadowbrook Baptist Church in Waco. Since graduating from Truett, Bortey continually encouraged both York and Cason to visit her ministry in Ghana. By collaborating and coordinating their visits together, York and Cason were finally able to make the trip happen in 2018. In Ghana, York and Cason twice facilitated a two-day pastors seminar entitled “The Church: Responsible and Worshiping?,” once at Calvary Baptist Church in Accra and once at Living Waters Assemblies of God Church in Kumasi. Cason presented on church administration and business in the church setting while York focused his discussions on leadership and worship. Over 50 participants, mostly local Baptist pastors, attended the two seminars, and they welcomed the expertise of York and Cason warmly and with many questions. The seminar participants also included three special attendees—Truett alumni Vincent Asamoah, Anthony Badu, and Kwame Acheampong. Vincent Asamoah, MDiv ’09, is the Founder and Director of Shoot4Life Ministries and the Global Regional Coordinator of the Fellowship of Christian Athletes for Central Africa. Anthony Badu, MDiv ’10, is the pastor of Ascension Baptist Church in Kumasi, where he has grown the church from an attendance of 250 to 600 and established three new churches. Kwame Acheampong, MDiv ’10, is the lead pastor of ADOM (Grace) Baptist Church in Techiman, where church attendance has increased from 65 to 200 under his leadership, and where he has also started a senior citizens ministry and a Cooperative Credit Union. Both York and Cason enjoyed the chance to reconnect with the Truett Seminary alumni who are doing great work in Ghana as well the opportunity to share their experience and expertise with the pastors who attended the seminars. However, while the duo from Truett certainly made an impact on those they interacted with in Ghana, they did not leave unchanged themselves.